Have you found a Kindness Charm or have you put one in a special place? Has SedonaKind touched you in some way? SedonaKind encourages acts of kindness locally and around the world and our Kindness Charms have been spread around the world. The heartfelt responses have inspired us to expand our effort. If you have found one of our Charms, passed on one of our Charms, or have been touched or inspired by SedonaKind in some way please share your story with us by filling out the from below. You can even upload a photo if you wish. Below the form read the stories of those touched by Kindness. ​By sharing your story in our comments section you are giving us permission to publish your comments on this page. Thank you! There is super hero strength in KINDNESS. An authentic smile or a wise grin can expand goodness in unexpected ways…. surprising ways! 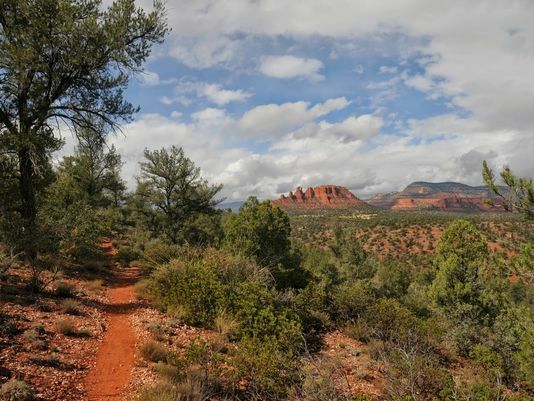 Just imagine for a moment, that you are hiking along one of Sedona’s myriad trails. Perhaps the red canyon wall towers above as you step over rocks and tree roots. Cicadas are singing. Your boots are dusty red and your mouth is dry. Ravens fly overhead and the azure sky deepens with the growing afternoon shadows. You are heading back to your vehicle after a satisfying trek and your water bottle is empty. A glint of something catches your eye on a low hanging alligator juniper branch just ahead. As you draw closer, a tiny splash of color refracts against the green background. What could it be? 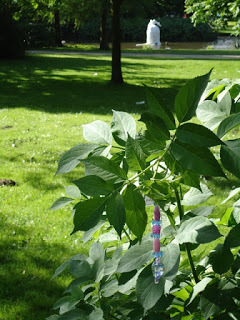 You reach into the branch and remove a delicate keychain made of various colored crystal beads attached to a charm that says “Women of Sedona” on one side and “Take Me Home & Spread Kindness” on the flip side. Are you serious? Not only has someone left a surprise for me out on the trail, but poured enough love into hand-making it, brimming with Kindness that I can share it with others? The glimmer of the crystals reflect the warmth coming from he hearts of those who made the charm. What a brilliant idea! You receive the charm and the kindness with gratitude, which warms your last few steps back to your car. Indeed, your heart has been expanded. 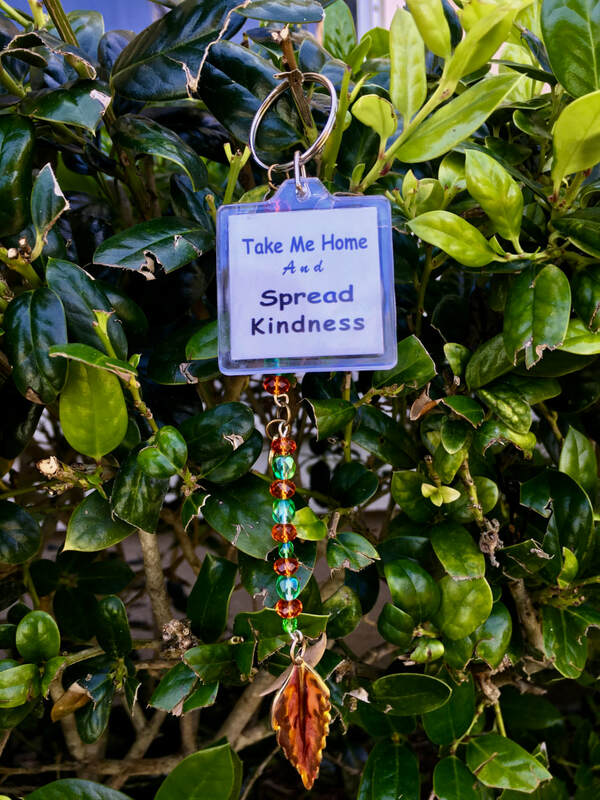 The beads dance on your keychain as you drive back to your hotel, As you wash up for dinner, the notion of Sedona Kindness takes seed in your thoughts …through dinner and even into your dreams, where you ask yourself how to spread kindness when you return home from your holiday. Now THAT’S strength in small packaging! Sedona Kind is a group of gloriously enthusiastic souls who put twinkle in project they tackle. 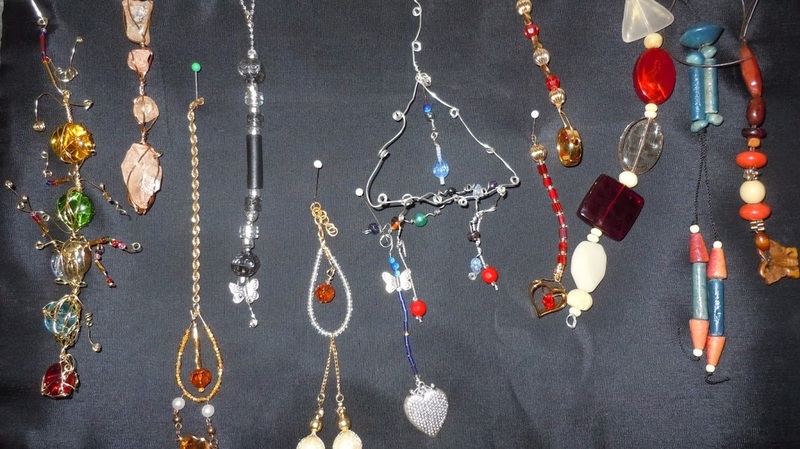 It started with ladies who enjoyed making keychain charms and then dangling them from bushes or trees. This form of ‘gifting’ is spreading kindness across the world. You can visit their website or SedonaKind Sedona FB page to learn more about their various endeavors! ​This is Jan, my "former" real estate partner in Salem Oregon. She gave me a huge pile of jewelry from her Mother and Grandmother. When she said how difficult it was for her to give up their jewelry, I mentioned that we have made charms to hang in honor of someone when we travel. It worked out perfectly, as Jan was heading to the Oregon coast where her Grandmother loved to go; and my daughter is taking two back to Maui where her Mother liked to travel. Jan was very grateful that I made the charms specifically for her using their jewelry. How delighted I was to receive an email this January with photos and see that their travel wish HAD been granted! There they were in Scotland and their smiles told the tale as well as the email which was full of joy. The charm was left in the last destination so now the journey will continue on from Loch Ness. Funny how things happen,I was having a bad day.... Feeling frustrated and unappreciated . And I opened my front door to go to the garage and do some errands, and what do I find?. A darling ceramic heart with a note attached from Brenda Cosse. Needless to say.. I started to cry with gratitude. This was right before Valentines Day, and I looked @ the wind blowing my heart banner from the tree for the holiday, and I was @ peace and smiling. Your visit to the Center with the gift of Easter goodies inspired me to purchase Easter candy and make cards. Using the items you donated, I made many lovely baskets that I personally delivered to clients’ homes the day before Easter. The baskets and the impromptu visits were so well received. It was great fun playing Easter Bunny and I thank you for your donations which made for a day to remember, not only for myself, but also for many of our sweet Meals on Wheels clients. One lady, well into her 90s, looked at the basket being held out to her at her open door, and with the wide eyes and big smile of a young girl, she said, “An Easter Basket! This is the first Easter Basket I have ever received!” As you can well imagine, I walked back to the car with tears in my eyes. I took a few charms to Seattle for a visit with my grandchildren. I thought you would appreciate this story. The woman, Susan, in the photo is homeless and was selling the newspaper they write to make a little money. You may notice the lead article in paper was about Susan and her art work. She happens to make the felt hearts she gave to each of my grandchildren when we were chatting with her outside the local market. After a bit of shopping, my 10 year old granddaughter said she would like to give Susan her charm to thank her for how she spreads kindness and love with her felt hearts. Susan was deeply appreciative and very happy. A bit hard to see the charm but Susan is holding it. My husband and I traveled to Sedona from New York for our first vacation since the birth of our daughter 19 months ago. I found my kindness charm outside the Secret Garden Cafe in Tlaquepaque. After news of the awful terrorist attacks in Paris,and the alarmist warnings of an imminent attack on New York, the charm was a gentle reminder that there is goodness and purity in our world. May it always prevail. Thanks for making my day of hiking even brighter! There is now a charm up on whistler mountain in British Columbia!! Whilst on holidays at the Bitter End we met and became friendly with Vince, his wife Lucille, their son Michael and extended family. Unbeknownst to us initially Vince et al found one of your kindness Charms hanging from a Tree at the Bitter End and, having thought about it, they passed it on to my wife and I so we could bring it back to Ireland. We are now back in Ireland, County Wexford (where the Kennedy dynasty originated in Ireland is one well-known American link) and we will hang the charm at a suitable location in Ireland from which it can pass on the message of kindness. NOTE:- If the importance of kindness is underestimated then consider reading George Saunders 8 minute address to Syracuse graduation students last year, i.e. 2013, or view his speech on YouTube. Hello, my name is Ana and I just wanted to tell you how very excited I was to find your charm! I found it on the path in Sedona where they were having the marathon yesterday, February 2. What is ironic is when I saw it it reminded me of Ben's Bells in Tucson, needless to say I was very excited to find out that you lovely ladies were doing the same things as them. I am a Tucson native, currently a student at NAU, and the Ben's Bell project has been very close to my heart. I have seen them do so many acts of kindness and you can see it transforming our city for the better. Keep up the great work ladies! ​We have been in Sedona for several days on family business and I have been blessed to find your charm in my family members kitchen drawer . I have looked at it several times without picking it as to not disturb her items but finally gave it- I just had to. One thing led to another and here I am. 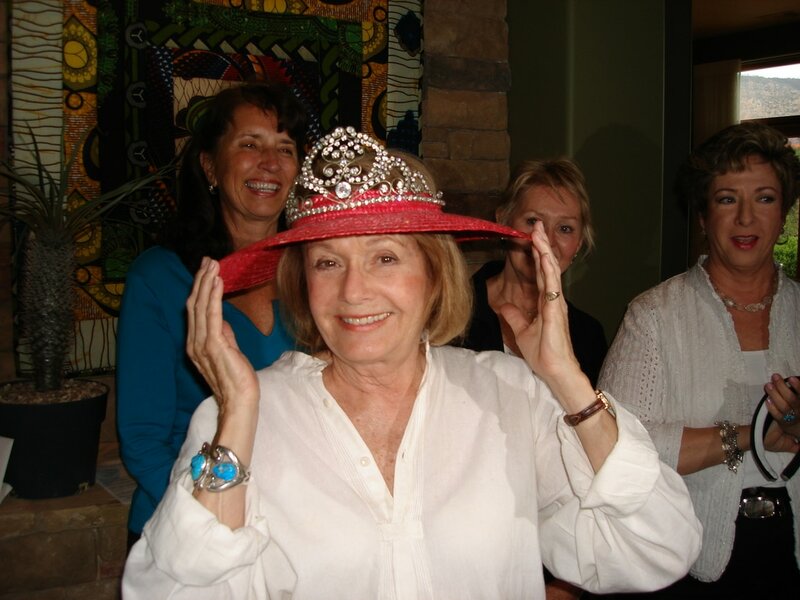 Our family member is Shirley Carroll who you may or may not know. Shirley and her late husband Bob have been involved with the art community most of the 20 plus years that they lived here. 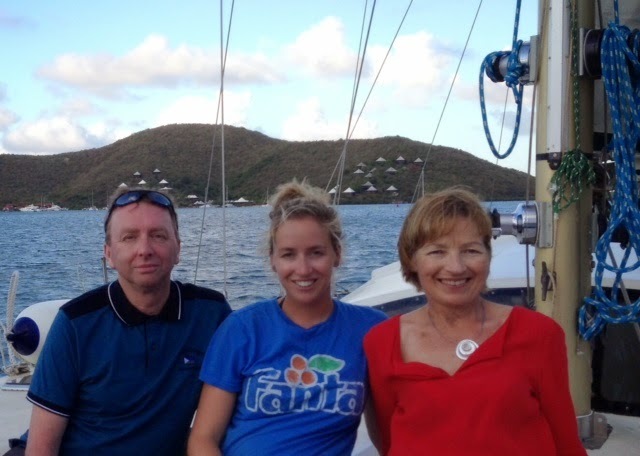 Following Bobs illness and passing, Shirley has struggled with her own health issues. I hesitate to take this charm of hers as someone must have given it to her as a get well kindness gesture. Is there a way that I could get one? Would you believe that I spent all day Saturday looking for one? The universe did not want me to find one that day. I also would like to take this gesture back to my area and bringing people's faces looking towards the sky rather than looking down. Would to have your permission to do so? I could see this in a way to honor loved ones who are sick or who have passed. I feel very strongly about this. My story is that I have been medically retired for 4 years . I have epilepsy and a memory disorder that does not allow me to work in my former profession, a health educator/ social worker. I also was the area coordinator for the Random Acts of Kindness . I feel very strongly about this and practice what I preach daily . My husband is a retired school superintendent . He is also medically retired with Parkinson's Disease slowing him down some days. We have been looking for something to do and this has inspired us to make the world a better place in honor of those we know and love. We leave early Tuesday morning. Can you point me in the right direction as to where the universe just might allow me to find one? Thank you for your time. Thank you for making the difference in the world and doing it in such a beautiful way. I do hope that you will allow me the honor of making the central valley of California - Visalia in particular - a better place. 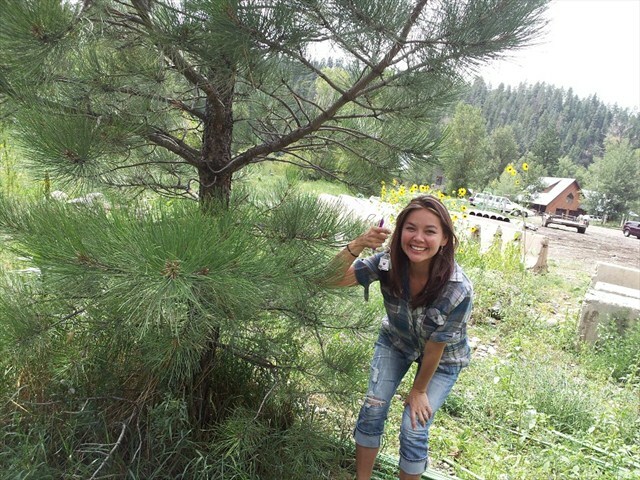 Hattie my granddaughter is so excited to go hang them in trees. She is putting one in the yard at her pre-school, her favorite park and in a tree at home so her mom can find it. We are going to put the others in Bend and Redmond. She thinks everyone will be kind after she does this. If only we could think like 5 year olds. Thanks so much it has been an uplifting activity in the middle of a ugh! winter. Have a blessed and peaceful holiday season! I lost ten family members in the Sutherland Springs Texas Church shooting and other family members were wounded physically and emotionally on that day...we lost over half our family in the blink of an eye...SedonaKind send me a beautiful care package but the Universe was already conspiring to make it even more of a miracle..here is the story...eternally and ecstatically GRATEFUL!!!!!! i really don't want to cry any more. i'm thinking: "ok...cry a bit but seriously, is that the best way, the only way, to have emotions move through you?" i mean when you cry you look ugly, you get a headache, burning eyes, aching jaw, you feel AWFUL the next day...and how do you EVER cry enough to move a massive amount of emotions through one's soul?...and IS crying the ONLY way to move this emotional energy? i'm thinking, "this IS literally energy.... emotional energy"...there has to be more than one way to process it and move it out of your body...i mean, the whole idea is to go from feeling rotten to JOY...joy is our intended stage of being!! !...there has to be a way to turn emotions that don't feel good into LOVE! so i began to think of things that would help and maybe not feel as awful as a crying hangover.....i thought of making music, of dancing, i thought of singing, i thought of meditating and praying...i thought of gentle nostalgic weeps that come from writing about what i am feeling...i'm doing all of these and they all help. but then i got a "nudge" to go see a screening of a new film called Heal and someone in the film was throwing rocks into the woods to help move their emotion out of their body and YAY, i found my idea!!! !...tho for me, i shall go to the ocean (i know where the rocky beaches are) i kind of don't want to bonk any woodland creatures on the head either...so i shall toss rocks into the water...i will give each rock a feeling that needs to transmute, i will toss it into the water and imagine the energetic charge from that emotion bursting free in the splash! oh wow, another good idea!!! i get ready for my day as usual, and as i am walking out the door there is a package on my doorstep...from an unknown giver...as i open it..here is what i found...PAINTED ROCKS!!! WHAT????!!!! on one side beautiful painted flowers much like what Robin was envisioning and on the other side, three hearts...a YES from the UNIVERSE!!!!! instant manifestation...the moment we shared that joy-filled idea, the moment we felt the joy of it as if it was already happening, the Universe shows up with a nod confirming that we are seen and heard and even encouraged...most of all we are LOVED...and that LOVE speaks to opened hearts...to those who follow the nudges..
what forces worked together to coordinate that synchronicity? can you even entertain one tiny speck of doubt that there is an unseen loving Hand that LOVES us so much it would arrange something like this?!!! OH WOW!!! live on little painted heart rocks! Bless us as we help LOVE thrive on our planet the way it was meant to BE, so we can all be free. 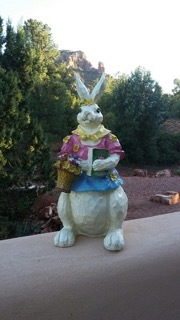 My son and I visited Sedona last week and stayed at the Alma de Sedona Inn and found one of the charms. This just made our experience so much more profound that I wanted to help in this effort. 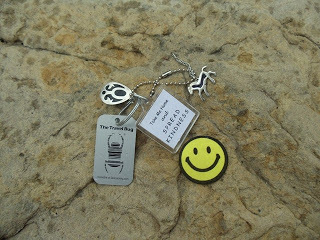 I placed my first charm in Wimberley, Texas another place in the Texas Hill Country that has similar energy to Sedona. This was brought home to us during the major flood two years ago Memorial Day and how the town is rebuilding. I have enclosed a picture of how the town celebrated their coming back during Memorial Day weekend. Spreading love and kindness around the world. Thank you so much for the lovely gift which arrived yesterday - I did check out the website to read more about the Boxes of Love and the Kindness Charms. What a wonderful way to spread kindness and love throughout the community! I will treasure this gift. Hope you are enjoying Sedona and the weather there. Today it's a glorious sunny afternoon in West Hartford with temps almost reaching 60 degrees. 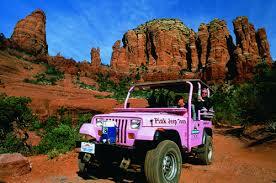 On May 15th my 8 year old grand daughter, Isabella went on the Pink jeep your with my daughter. On her walk up a trail she found this beautiful charm. Today we did the research, it is such a lovely piece of love and friendship to pass on to someone else. She decided to wait until our family trip to Orlando, FL in October to find the right person to share happiness with. Her feelings are hopeful that a family member of close friend of one of the loved ones lost in the tragedy will find it. She wants to bring a little happiness to a sad heart. She is s very loving young lady. I will be with her, we will find a special place. I will be in Orlando, FL in October and I will find a special place to leave it for someone else. I hope the next person who finds it will pass it on also. 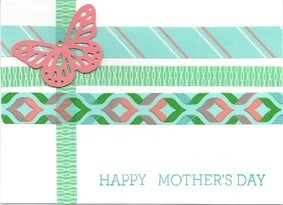 A quick note to let you know how touched our Meals on Wheels ladies were with Mother’s Day cards you so lovingly crafted. I received many comments from the drivers that the clients delighted in being remembered with the beautiful handmade cards. Many thanks for your time and your thoughtfulness. I am recovering from a total hip replacement and today was a very painful and tough day for me. I had been sitting in my traveling chair, crying and I told the staff and my husband that I wanted to go back to my room. When I looked back to sit in the chair the charm was on the table. It made me realize that someone had noticed and cared. It made all the difference in the world. My 7 year old great granddaughter Austyn and I accompanied my husband to his oncologist appointment last week in Sedona. As children aren't allowed into the oncology area Austyn said we should "investigate" the grounds outside the building. 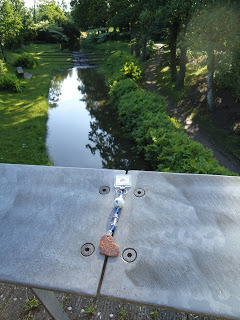 As we neared the little wooden bridge, we spied a sparkle in a small tree branch and discovered one of your "Spread Kindness" chains dangling there. It was like being given a secret blessing. Austyn was thrilled and I was so touched, this message from unknown benefactors was like being touched by angels. Thank you. I left a charm by a lighthouse in Australia to commemorate our reading of The Light Between Oceans, discussed by our book club--many of whom are charmers.The coincidence was just too great." Our lives are short- we have so little time to gladden the hearts of those we travel with. Also let us be swift to love.... and hasten to be kind." In our third year, our lovely Women of Sedona show our faces! We have given our charms to thousands in EVERY state of the US and nearly every country of our world! Charming Mother - Daughter team Ali and Annabelle (6). Grandma Sally writes - "She is going to be seven in September. I didn't help her at all and Ali didn't do much except get her started.I took two into Boston several weeks ago and one might have ended up in the archives.....part of marathon history.We are loving every minute...."
I love to Geocache, and this summer I hid a nice cache in the mountains of Colorado. In this cache, I put a travel bug attached to a Kindness Charm. The charm has now traveled from the Rocky Mountains, to Hawaii, and is now in Australia! Here are a few pictures of its travels, taking our message of kindness across the world! My name is Gwen Waldecker. I left a message on Facebook and saw this email address, so I wanted to leave it here also. A friend of mine, Linda, and her husband just moved from Ky to Colorado. I only met Linda a few months before she left. I teach Zumba and she came to my class. I also practice something called Re-connective healing. During our short time of knowing each other, we have had all these connections between us. From the moment I met her I felt a strong tie to her like I have not felt before. Before Linda left, I told her about a web site I found that was dedicated to reporting acts of kindness, and ideas for showing acts of kindness. I found this web site from a book I read called "The Bond" by Lynne Mctaggart. I told her some of the stories. I was going to give her cards I printed out from the site to spread around Colorado. They are pay if forward cards. Whenever anyone anonymously or gives any type of kindness act toward another, we leave the cards for that person to then spread the act of kindness to others. Anyway, time got short and I forgot to give her the cards. kindest people I have met. She will spread the kindness bug. I am so happy that Linda found your Charm and she shared the story with me. Thank you! i found one of your charm bracelets today on a walk through the channel ridge trail on salt spring island, british columbia. Totally lit me up. thank you. black beads dangled in the breeze. I was reminded to spread kindness -- especially to myself, as I recuperatedfrom major eye surgery. 2.5 months after the surgery, my vision improved from legally blindto 25/20 vision. Thank you for the love and kindness. Thank you for being angels. I found the charms hanging from a tree outside of Basha's. I took my cart over to the curb and saw what I thought was someone's earring hooked to the branch. To my surprise it was a gift and a blessing meant for me. There are no accidents in this universe and even the charms have significance to me. I had to email you to let you know how sweet, kind, and thoughtful you all are. I lost my husband over a year ago, and felt a little down this weekend, but there was the divine spirit leading me over to the tree. Words cannot express how touched I was. With a smile in my heart, I am grateful to know that there are people out there who care and I call them angels. Thanks for being who your are and all that you do. It was magical meeting you at the pool, Jawn. Your SedonaKindness group idea deeply touched and inspired me. When we returned home, we were overjoyed to find your kind gift. The beautifully , perfectly boxed and wrapped charm, the message card, and descriptive brochure and your wonderful website represent an amazing 7 year project. What terrific teamwork! Your kind gestures are sincerely appreciated. I would love to be on your email list to receive your monthly newsletter. 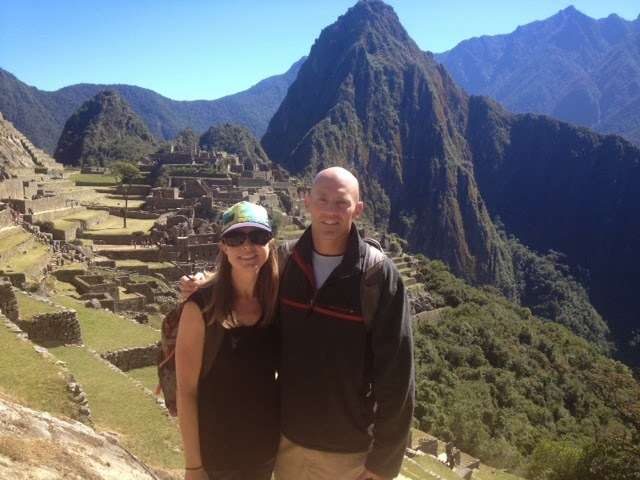 John Metras and Kathy La Berge. On a recent trip to Italy, we met this lovely bistro owner named Ilario (Hilary). She was very sweet and outgoing. As busy as she was, placing orders; working with the kitchen staff; and greeting guest; she took a few minutes to visit with us. 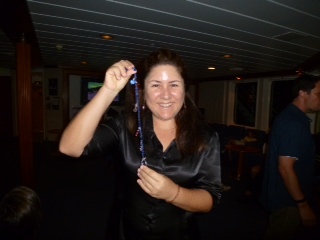 Ilario was thrilled when I gave her this charm and explained SedonaKind to her. She told me that she starts each day in a deep meditation, knowing the trials that owning a Bistro can present. It is her “Meditation of Kindness” in which she imagines some of the issues that might come up and then finding ways to solve the problems with Kindness. She told us it was what has kept her happy and successful over her long career. When something negative arises ~ she has a ready solution. What a wonderful way to live your life! Ilario, I’m so glad that I met you! I found this charm hanging on a tree as my wife Pat and I walked the trail with friends on a lovely sunny day.. It made us all smile and it felt good to experience an act of random kindness when the daily news makes it seem that violence, disrespect and anger are the emotions of the day. Thank you for this message of hope and love. My wife plans to take this charm and leave it in a peace garden in the middle of one of the poorest sections of Baltimore City. We love our city but it hurting right now and in a lot of trouble. Our wish is that this charm finds its way into the hands of someone who has lost hope and that it gives them a reason to believe things will get better. 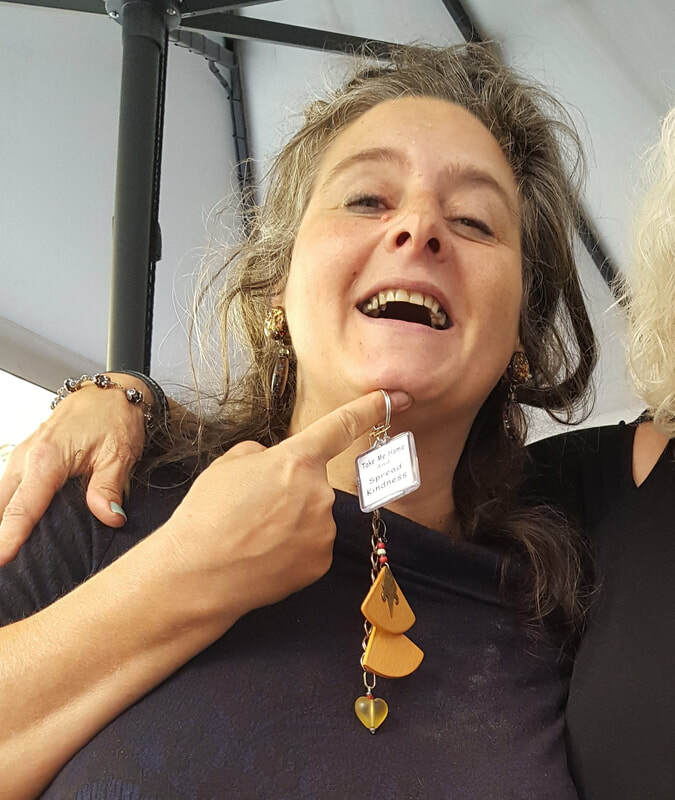 My husband and I had another delightful time placing SedonaKind charms as we traveled from Barcelona to Lisbon and then flew to Paris to join family. 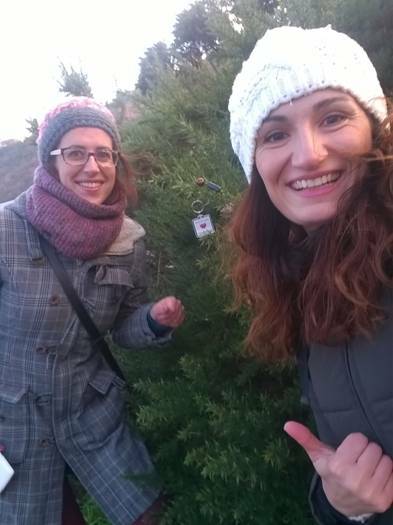 We even gave two charms to our 7 and 10 year old granddaughters who were SO excited to be given such a ‘grown-up’ task and took their responsibility very seriously! My final charm was bestowed upon our wonderful hotel concierge, Williams, who has become like a friend to us after this, our second visit. His reaction was truly touching as he turned it over and over in his hands and finally announced that he would hang it in his entry where he would see it every time he came home from work! We’ll check back with him when we revisit next May. At the end of a terrible day, I wanted to go for a hike. I felt guided to go on the Girdner Trail just outside of Sedona. I thought, the fresh air and walking would help me feel better, but I felt as stuck and angry as I had before. Then suddenly I saw the charm hanging off a twig near the trail. I couldn't believe that it said "Take Me Home and Spread Kindness". I burst into tears, and immediately felt different. I knew that I had been guided to go on that trail so I would find the charm. To me it was a love note from the universe. Thank you with all my heart, to whomever placed the Kindness Charm. So beautiful. Hi! A couple years ago Marjorie Miller would make charms with you. I'm her granddaughter and I just wanted you to know that I'm spending the kindness in New Zealand. In a couple weeks, my school has a market day. I'm reusing the charms that You used to use to make some key chains that are made of rope and your charms. Hi!!!!!! We are Adamantia and Poly we are friends and work together in Greece. So.....one beautiful day we saw a sweet lady leaving this key rings out of the shop we work!!!!! We took it with us and now we are dreaming of a big journey to leave it to another place of the world! 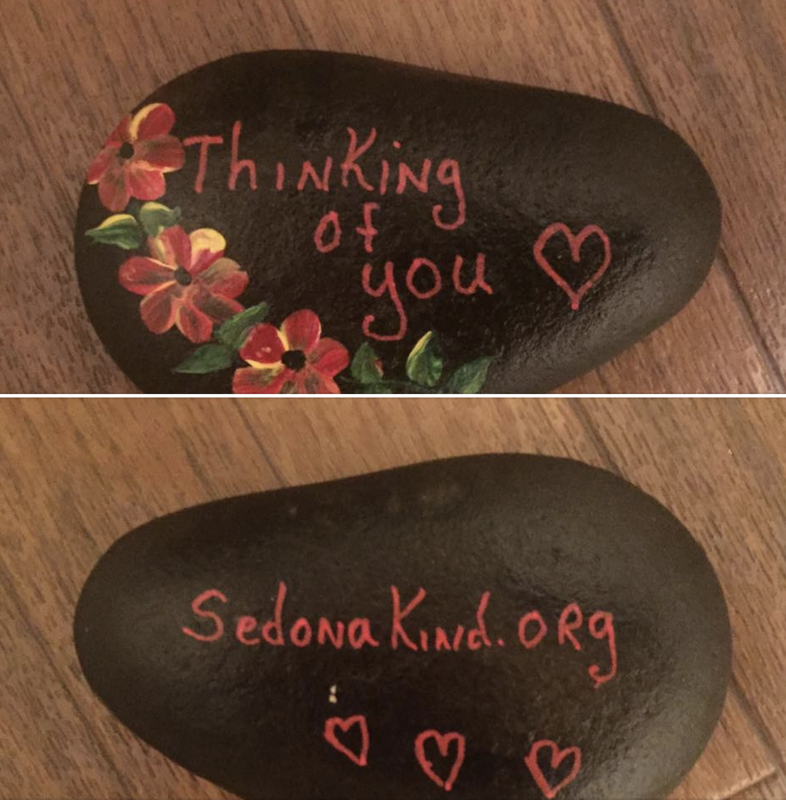 "One of the joys of SedonaKind has been all the responses we've gotten from people who have found our charms, or visited our website. Kindness does connect people in unexpected and wonderful ways, and we want to share a special one with all of you. "J" was visiting Sedona in Spring of 2015, and read about SedonaKind in the RRNews. It touched her heart, and when she got back to New York City, where she lives, it was still resonating. So.... she and her family and some friends decided to start their own way of spreading kindness, and they call it KindnessRocks. ​They officially founded their organization on New Years Day, 2016. They have a wonderful website KindnessRocksNYC.org with pictures, stories, and "tips" for easy ways to spread kindness. Their magical way spreading the word, is to go to Long Island Sound, and gather beautiful white rocks. They infuse the rocks with reiki energy, and then, as "J" puts it "places them in random places to be found by YOU!" The rocks are painted with inspiring words: faith, peace, courage, believe, joy, love, smile, hope , and of course, be kind. I was out walking in Singapore this morning with a friend and found one of your wonderful kindness charms hanging from a tree. It was on a tree by a pavement that links the Henderson Waves Bridge & Mt Faber. This is a small island with millions of people and on a public holiday like today there are crowds everywhere. But it was me that was called to stop, turn, look over the fence and into the tree and there it was. I wonder how many people have walked past in recent days, weeks, months & not felt its presence. It has been a very challenging three months and to remain balanced, centered & connected to my truth I need to remember to meet the bitterness and anger of others with kindness. It is no coincidence your charm found me. We found a kindness charm in the week following the death of our grandson.Reading the story of Ben's bells and the women of Sedona and their kindness charms touched us.In memory of our grandson, we will create some charms and hope they, too, find someone who will help spread kindness. I was re-reading the email that I received from Joy and Sandy the Women of Sedona as I sit here thinking of my baby grandson and still trying to come to terms that that loss. It made me wonder if I had ever shared any pictures of the women who gathered at my house to make charms or any pics of the charms themselves. I want you to know that I received pictures of a charm left in Hawaii (and when they went back the next day, it was gone), one in Mexico and one in Albuquerque -- all found within days. I actually got some pics of a few of them charms that were placed about. 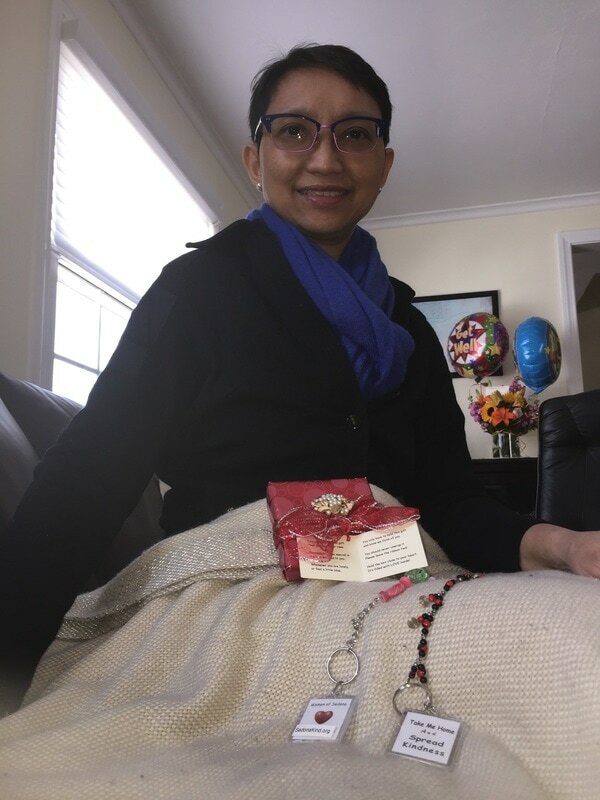 I am still trying to come to terms with the loss of that sweet baby and find that I had to put aside the charms for awhile in an attempt to try and "move on" -- I am finding, though, that the kindness message has truly touched those involved and those that have found them. I give a scholarship in memory of my grandson. Last year, in with the scholarship certificate, I enclosed a kindness charm. It was displayed at the graduation reception and many people read the story of how we found ours in Sedona. Please pass on my greetings and best wishes. I will try to send you a couple of pics, too. I was notified that a charm was placed (and found) in Hawaii, Mexico, and at a county fair here in MN. A little boy also found a charm on a walking path here in our home town. His mother--who knew the story of the Women of Sedona and of little Charlie--was able to share that story with her son who chose to take home the charm and keep it on his bulletin board in his bedroom. I kind of lost count of the number of charms that we have made, but I would guess it to be well over 200 . I took pictures of the every one at first, but have not recently done so---I would recognize them, though. I left 7 in total -- Namibia, Botswana 2, Zambia 2 and Zimbabwe 2. Seeing the people's reactions when I gave them and explained what they were all about was most incredible! Certainly made me feel good." Thanks so much for enabling me to be a part of this project, I truly enjoyed it, and please give the ladies my regards! Yay! My husband is a proud recipient of your special charm. He is an avid geocacher and felt so honored to have been led to this charm with such a lovely message. We are spreaders of kindness, and we are already planning on placing this charm in another cache that Mike puts out shortly. What a great idea - spreading kindness, compassion, and joy is what we are intended to do while spending time on planet Earth! Keep up the fantastic work; what a great way to build community!